Prequalified for plan- and design competition in Tønsberg! Contract signed for Furuset Hageby in Oslo! New pictures from onsite projects, here is Randaberg shaping up! 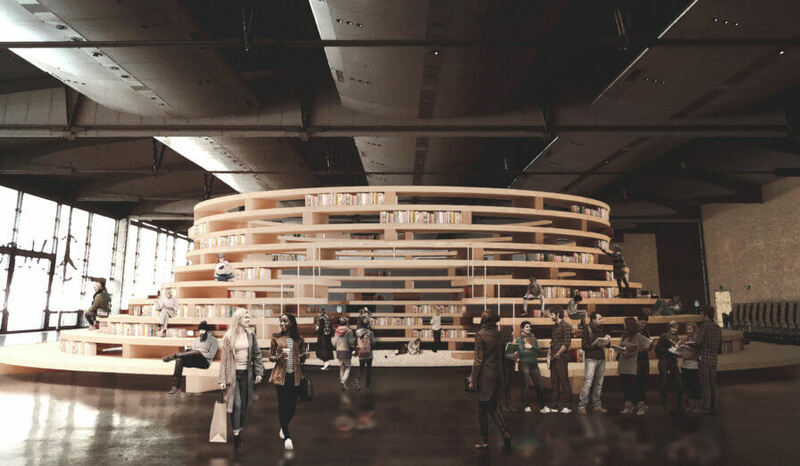 Our proposal for the Norwegian Pavilion at the Frankfurt Book Fair (October 2019) received the runner-up jury award ‘INNKJØP’ attributed to three teams amongst a total of 66 entries! Two honourable mentions were also given. “Cave” and “Clearing” are respectively convex and concave circular pavilions that use structural terraced wood elements. Books are made available for consultation to all visitors in-between the wood lamellas of the stepped structures. The project is based on the symbolism of platonic shapes. It utilizes the warmth and modular properties of wood to create cosy spaces for individual reading, press interviews, meetings, debates, art shows or lectures. New images from our nearly completed Sabou School! Site in Lyngdal breaks ground! 3RW arkitekter with HLM Arkitekter wins competition for a new school in Kopervik! Logen Teater phase 1 opens to public! 3RW arkitekter and COWI win new contract for the Norwegian Defence Estates Agency! Thank you to everyone who joined us last Friday for the annual 3RW party! Grønneviksøren in Bangkok, Thailand ! 3RW is invited to the Venezia biennale for the third time! The City Between Freedom and Security, publication by BAS, NSM and PST will be presented by Line Myhre Flores with Anders Rubing part of this year Sikkerhetskonferansen in Oslo on March 17th, do not miss out! Preview from office building at Laksevaag. Material and construction in prefab wood. Preview of the Stavanger office reconstruction in Stavanger. Straumehagen housing project is growing day and night. Bontalabo on the front page! 3RW is developing a northern gateway to Bergen with regional plan for Meland municipality and Knarvik. It brings 3,000 new housing with public and mixed-use program on Flatøy island, connecting the two cities. The plan for Ullandhaug campus is delivered. Very interesting study and very good feedback! 3RW party invitation is here. Welcome! 3RW arkitekter and landscape firm Smedvigs Landskapsarkitekter AS are among the two teams selected to rethink the university district of Stavanger and Sola. The local newspaper Avisa Hordaland present status of planning work on Bømoen. The Clearing. The story of a butterfly and the creation of a memorial. Ongoing environmental investigations at Bømoen. We discuss the future of Norwegian architecture tonight at ROM for Kunst og arkitektur. Do you want to take part in shaping the future of Bergen? The memorial ‘’ Lysningen – The Clearing ’’ at Utøya is breaking ground. The transformation of the public square in Osøyro breaks ground. 3RW selected by Bergen Municipality in parallel frame agreement for future development in the city. Notification of commencement of planning work in Os municipality. 3RW arkitekter, in cooperation with SWECO Norge AS, has won the contract for the extension of Bergen Light Rail (Bybanen). Grønneviksøren Student Apartments is featured in the April issue of DETAIL. Our second project in Sotra kystby, a 43 housing building, breaks ground. Ongoing planning process Bømoen halfway with impact assessments. The school in Burkino Faso are in the weld! Saturday night around 500 people transformed Bryggerhuset 3RW`s party to a happy disco-tale. Thanks!!! 3RW wins the competition to design memorial on Utøya. 3RW at Swedish Association of Architects architecture gala! Article on 3RW’s feasibility study in Indre Arna! 3RWs Grønneviksøren has been nominated for the European Union Prize for Contemporary Architecture – Mies van der Rohe Award 2015! 3RWs “Viewpoint Askvågen” featured in Ken Schluchtmann’s photo book – “Architecture and Landscape in Norway”! 3RW signs new contract with The Norwegian Defence Estates Agency! 3RW in Venice for the Architecture Biennale 2014! 3RW’s proposal for memorial on Utøya featured on Nasjonalgalleriet, NRK! 3RW and NORD wins “EU Innobuild” competition on developing care homes in Lyngdal, Norway! Sixten Rahlff is giving a lecture at the Prague Landscape Festival, September 4th! Haakon Rasmussen gives a talk at the “Designing out crime” seminar, October 13th! Espen Rahlff in D2 magazine! 3RW shortlisted to propose feasibility study for Indre Arna! Haakon Rasmussen gives a talk on Arkitekturdagen in Bergen, September 11th! Grønneviksøren to the top in photo competition! 3RW wins “Bydraget i Os” – transformation of the public square in Osøyro. 3RW’s Askvågen Viewpoint-project exhibited in Landscape Festival Prague 2014! 3RW is one of three architect firms to be assigned a framework agreement for Os municipality! 3RW shortlisted to propose memorial on Utøya. City, village or cityvillage? How do we create a lively center in Kleppestø, Askøy? Do we have visions for the center of Bergen? How do we make it attractive and eventful, with good qualities and viable commerce? Read “Lagunens uutholdelige letthet” by Sixten Rahlff in the new issue of Eiendomsmagasinet. 3RW is invited to the competition about transformation of the puplic square at Osøyro. Grønneviksøren is published in Zeppelin No 121/Feb. 2014. 3RW wins competition to develop 12 000 m2 health care facilities in Randaberg! Saturday night 500 people were drinking 3RW Bryggerhuset’s excelent home-made beer. What a night!!! 3RW sin tradisjonsrike fest avholdes 15.02.2014!!!! 3RW in Barcelona for X – mas coctails!!! 3RW at Cornell university – USA. Håkon foreleser for Bergen kommune/byutviklingsakademiet om sikkerhetshensyn i arealplanlegging. Student housing at Grønneviksøren is nominated for The Bergen municipality architecture award! Så er det klart for innflytting på Sartorgaarden! Sixten Rahlff foreleser på Klubb Klorofyll om “Grønne fremtidsdrømmer for byen” . Sixten Rahlff foreleser på Manøver om Bergens videre byutvikling – med kulturfeltet som pådriver. Haakon Rasmussen foreleser om sikkerhet i det offentlige rom. 3RW har fått ny hjemmeside og logo!! !